With all of the adventures we are going on and all of the pictures we are taking, certainly one of them had to be a great one, a keeper, the picture that captures the moment. Well my wonderful husband Kirk caught that very picture and it was right in our own backyard during the Eyes to the Sky Balloon Festival held annually in Salina, Utah. A beautiful picture of a balloon floating low over Redmond Lake with a reflection on the water and mountains in the background. We decided to have that very picture made into a canvas print and WOW, BEAUTIFUL!! Canvas prints really make a picture more impressive. The canvas wraps around a frame and stands out as a beautiful piece of artwork. Well, we were not going to keep this to ourselves. When you have something so amazing, you should share it. So we took it over to the Sevier County Fair in Richfield, Utah for judging and guess what? Kirk won a BIG Blue Ribbon, not a little one, but a big one which means that he took second place overall in this category. Do I sound like the proud wife? Well I am. 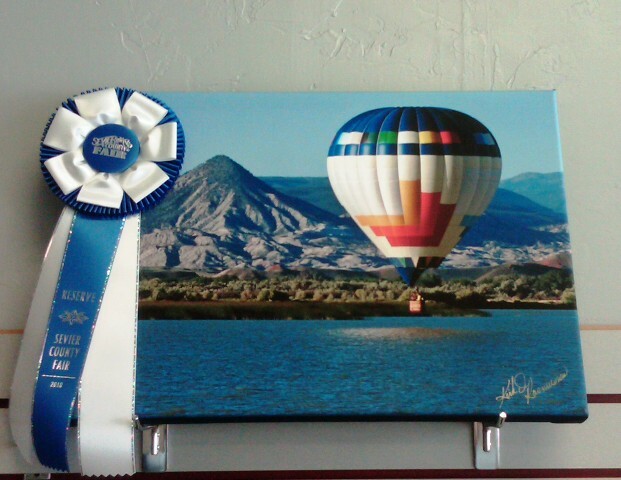 Back to the art show part of the fair: Here is a picture of the awesome photo with it’s spectacular blue ribbon. Congratulations Kirk on a wonderful presentation!